Are Mobile Apps a Game Changer for Food Safety Professionals? Many food safety and quality assurance (FSQA) professionals are constantly on the go in the workplace. They can be found on the floor of a manufacturing facility, off-site conducting supplier audits, or out in the field performing pre-harvest inspections, just to name a few locations during their busy day. “To benefit from food safety automation, these folks need more than the capability of logging into a system through a desktop,” says Levin. “They need a true mobile app that provides automation support out in the field,” says Barbara Levin, senior vice president of marketing and customer community at SafetyChain. While other industries have been quick to adopt mobile platforms, the food safety industry has been much slower. Adoption is, however, gaining traction. In a recent conversation with Food Safety Tech, Levin talks about the value of FSQA mobile apps in today’s environment, where access to real-time, actionable data is crucial for the food industry. Food Safety Tech: What common challenges faced by FSQA teams do mobile apps specifically address? Getting timely feedback on non-compliances for CAPA. When FSQA data is inspected at the end of the shift on paper, finding non-conformances often means rework. The instances in which this happens are too numerous to count. With mobile apps, you receive timely feedback. Information in the system is immediately analyzed to specs, so you’re catching non-compliances at the earliest point possible. Consistency in following your FSQA programs. This could be your USDA HACCP plan, FSMA HARPC plan, GFSI program, customer quality attributes and other components of your FSQA programs. Program components change all the time (i.e., Specifications, processes, rules in HACCP, GFSI code, forms, workflow, etc). Are FSQA managers confident that everyone is following the most up-to-date program? Is everyone following the workflow and doing everything in the right order? Are they completing tasks accurately? Using the right forms? Unfortunately companies find out that steps are missed or outdated forms were used during an audit; or when missed steps result in expensive rework or in the worst case, a customer rejection, withdrawal or a recall. Mobile apps will always have the most up-to-date forms, processes, specs and more. They act as a coach, leading the FSQA team member through the proper steps. When you enter incorrect or incomplete information on paper, it may not be detected until the end of the day or shift. A mobile app will issue an alert if incorrect information is entered; and it won’t let you submit a form if all fields aren’t complete. Because all of the updates are made in the system and pushed out to the app, if the specification changes while an FSQA team member is on the plant floor, when he or she logs in, the latest spec will always be there. You’re ensured that only the up-to-date program is being followed and that only the most up-to-date forms are being used. A lack of information for continuous improvement trending. If you have multiple facilities and products (resulting in mountains of FSQA paper), it’s a huge, manual task to make all of the data useful and relevant. With mobile apps, all FSQA data is entered “once and done,” making it accessible and actionable for immediate FSQA result tracking, daily KPI reporting and continuous improvement. Audit readiness. Mobile apps take audit readiness to a different level. With FSMA and GFSI, the saying is, if it’s not documented, you didn’t do it. By collecting FSQA data at the point of origin, all data is time and data stamped and uploaded to your permanent FSQA record. There’s no redundant data entry, mistakes are avoided, and there’s greater record efficacy that helps companies be audit ready, on demand. FST: What is the biggest benefit that FSQA mobile apps offer? Levin: The first benefit is real-time feedback. If you think about how things were done in the past, using an example of a pre-harvest inspection, you’re out there with a clipboard, making observations and recording non-compliances. Then you have to go back and enter the information into a spreadsheet, or turn it into a PDF, and send it to the food safety manager, who may or may not be sitting at his or her desk. Waiting to get a response equals time lost. And in the food industry, time equals money. When you’re entering information into a mobile app, it analyzes that information in real-time and according to specifications. 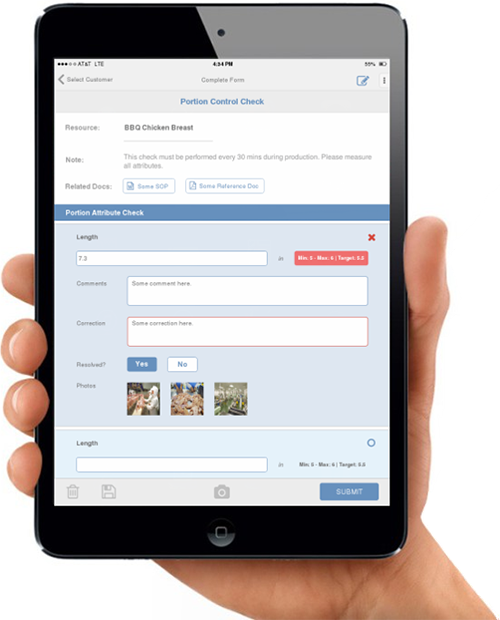 When there are non-compliances, alerts are pushed to the FSQA manager – wherever [he or she is located]. 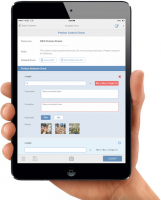 The manager can then generate a CAPA, which can then be completed, documented on the mobile device and electronically signed off by the manager. The process is expedited, and expensive rework is avoided. The second benefit involves data efficiencies. When data is collected on a mobile device, it’s entered only once and is then immediately available for multiple uses, such as a customer’s certificate of analysis, attachment to GFSI code for audit, or to be produced upon demand for a regulatory inspector. With a manual system, there’s a tremendous amount of redundant data entry. We hear this all the time from food safety folks— that they feel like they’re managing paper instead of food safety programs. When data is entered into a mobile app, it’s accessible immediately to FSQA, operations, vendor purchasing, management – any stakeholder who has a need. “The Power of FSQA Automation Via Mobile Applications” Download the whitepaperFST: What approach should be taken to encourage the investment in and implementation of an on-the-go FSQA mobile platform? Levin: I would love to think that in an ideal world, the creation of operational efficiencies that enable a higher level of confidence that you are sending out safer food is enough. Food companies are businesses, and they have obligations to consumers, which they take very seriously. But they also have obligations to their shareholders. When we talk to folks who really want this, it’s very easy to create a business case to senior management based on ROI. When you can close the gap by hours and days in the food industry, that time equals money. Avoiding rework also saves money. And there’s ROI in faster sales throughput and increased shelf life by reducing hold and release times. We’ve heard from our customers that the solutions have paid for themselves and started to create ROI within three to six months.